I've spent quite a bit of time trying to identify the above photo. Here's what I know -- the photo was taken by photographer Lee Balterman in Chicago circa 1955 and the theater across the street is the Oriental Theater on Randolph Street. I think I've managed to narrow down the possibilities to either Thompson's Cafeteria, Holloway House Cafeteria, or maybe even DeMet's Candies. Regardless, it's a great photo. I love the multi-tiered wire pie racks in the background. 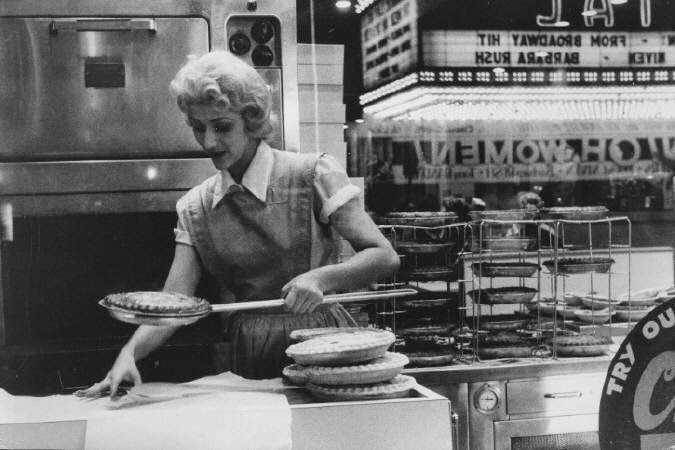 I'm always so careful when handling pies but check out how carelessly she's stacked the pies on top of one another. I guess when you're baking them by the dozens you spend less time worrying about slight imperfections.